This granola is all about those oat clusters! But really, just look at all those crisp, crunchy peanut buttery clusters! It took a few tries but I finally achieved those oat clusters I desired with just the right amount of peanut butter goodness. To help ensure the clusterability I firmly packed the granola onto a small rimmed baking sheet. I also resisted the urge to stir the granola as it baked. Lastly I made sure to let the granola fully cool before breaking it into clusters. Which was hard to do since the kitchen had a great toasty peanut butter aroma. Perfect for breakfast over yogurt, dessert over ice cream, or just for a snack by the handful! In a small saucepan over low heat add the peanut butter and honey mixing until smooth and combined. Remove from the heat and stir in the vanilla. Add the peanut butter mixture to the oats and stir until the oats are evenly coated. Transfer the oats to the prepared baking sheet and using the back of a spatula, evenly press the granola into the pan. I made sure the granola was firmly packed. Bake the granola for 30 minutes and golden brown, rotating the pan halfway through. Allow the granola to cool. 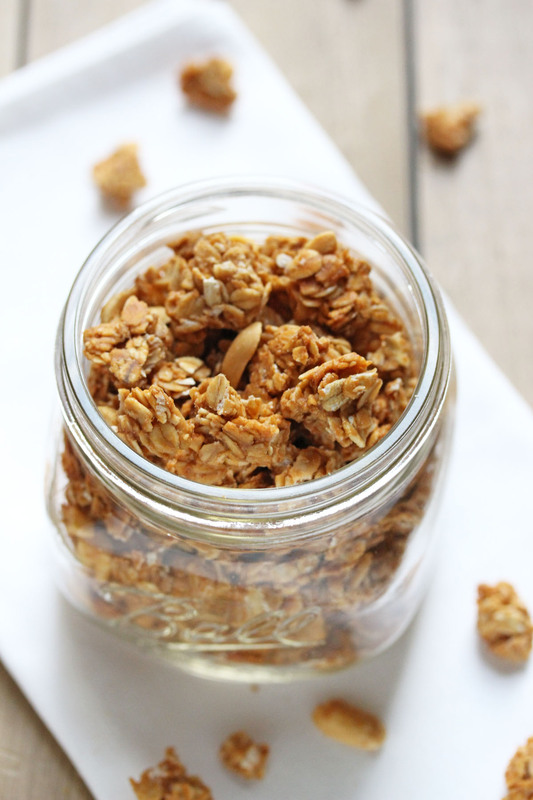 Once the granola has cooled, gently break up the granola into clusters. Enjoy! Store the granola in an airtight container.